Slept in. Breakfast of Ezekiel 4:9 Golden Flax cereal with raspberries, banana slices, and almond milk, and a French Press of coffee. Went to Goga for 20 minutes of workout and 15 minutes of sauna time. Brought a book to read in the sauna (Reckless Abandon by David Sitton, an autobiography of a missionary to PNG). After that, I came home, filled my water bottle, grabbed a granola bar, and went on a 5 mile walk in the neighborhoods surrounding ours. I am so thankful for this sunshine and the new blooms of springtime! After a hot shower, I met Bryan downtown, since he was there studying for his Microbiology test all day. I grabbed some red pepper strips and a mandarin orange on my way out the door and enjoyed them with a Grilled Chicken Caesar Salad from Port City Java. He studied for a bit more, then we checked out the new Anthropology store downtown (very cool, by the way!) before heading to dinner at 21 East. Bryan got a burger with root beer caramelized onions and a side of fries; I wasn’t super hungry (since the salad wasn’t that long ago), so I just got a single cajun crawfish taco (which was delicious! I might just have to get the 3 for $10 next time). It was a relaxing evening! I love date night! Church this morning. Then 2nd grade Journey Group, where we talked about God being “Unchanging.” Had my cousin, his girlfriend, and another friend over for a lunch of tacos and taco salad (beef with cumin and garlic; and shrimp with curry powder, red pepper flakes, and garlic; plus loads of fresh veggies). Shared a French Press of Columbian coffee with our guests. While Bryan and the gang continued to study, I went for another 5 mile walk…this time with book in hand. I read and walked and enjoyed the fresh air! Bryan grilled burgers for dinner, and I had a side of carrot sticks. Made some lemon corn muffins with a lemon glaze for dessert, which got gobbled up very quickly! (Recipe here; I used about a cup of powdered sugar instead of 1/3 c. white sugar in the glaze, and I used Jiffy cornbread mix instead of the suggested brand.) Will have to remember that! Watched some clips on Food Network, while sipping a vanilla almond iced coffee (leftovers from this afternoon’s brew). Time for a hot, Epsom salt bath before getting ready for bed and grabbing my book one more time for the weekend. Tonight was another random, last minute, double date night in. Our friends Leigh and Nate’s anniversary was yesterday, so I sent them an email and told them we should get together again soon. They suggested tonight, so we said sure! They came over for a healthful Lasagna (we use the recipe on the back of the Barilla No Bake Lasagna noodles box and substitute ground turkey for the beef/sausage; plus, every time it says to add meat, add meat AND veggies–we used 1 c. frozen spinach, 1 small zucchini, 1 small yellow squash and about 8 chopped baby carrots). Plus they brought garlic bread and we made a salad (see below). Green Salad with Carrots in the center, surrounded by a Caprese Salad of roma tomatoes, mozzarella, capers and chopped fresh basil. Drizzle with olive oil and your favorite vinegar and sprinkle with salt & pepper or your favorite seasoning grinder. Yum! For dessert, we had a rich cup of French Roast coffee and Double Chocolate Torte (gluten-free vegan recipe from Oh She Glows). Even the dessert is full of good-for-you stuff, don’t knock it before you’ve tried it. 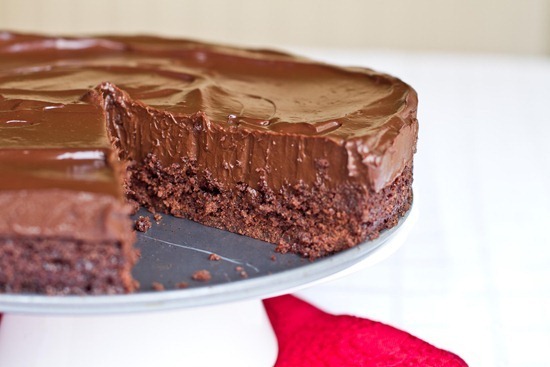 Seconds will be had…guilt-free! Delicious chilled, at room temperature, or my favorite way–frozen! After dessert, they ended up teaching us two new games. If you hadn’t noticed, games are one of our favorite things to do. We played a lot of games during our dating years, especially Settles of Catan, Ticket to Ride, Scrabble and Dutch Blitz. We even had game nights that we co-hosted weekly during our first couple of years of marriage. Six years later, the frequency of games has decreased, but we still enjoy board and card games quite a bit. Last time Nate and Leigh were here, they taught us Dominion, and it became a fast favorite, to the point we “had” to buy it and have played it for date nights multiple times since then (good for 2 players). 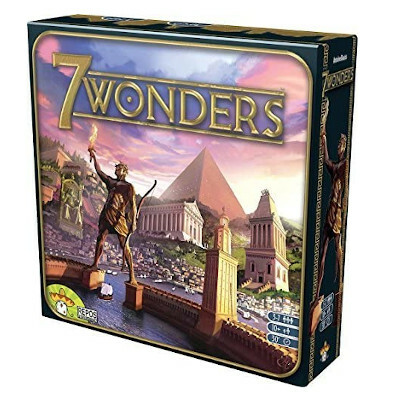 Tonight, they taught us Small World and 7 Wonders–both are very good games! “Risk”-esque game of conquering territories. Only 9 turns per player, but has a bit more of a learning curve than 7 Wonders and takes a bit more time with strategizing. A fast-paced, easy to learn game for 3+ players, with multiple strategies and outcomes. Thank God for like-minded friends and lasting memories of fun nights together! And Happy Anniversary, Nate and Leigh! 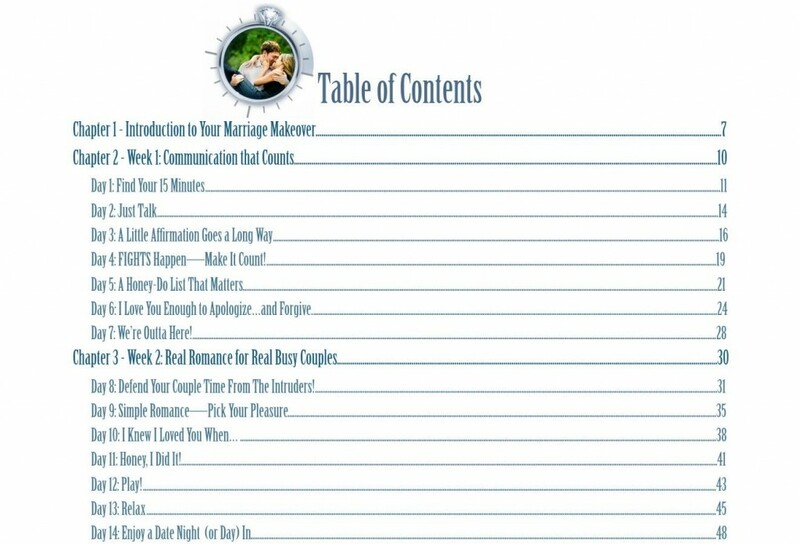 15 Minute Marriage Makeover is a 98-page e-Book by Dustin Reichmann that provides 28 days of topics to discuss or activities to do with your spouse. I purchased it as part of an e-Book package deal a while back and filed it under “Read Again!” It only takes 15 minutes a day (on most days). You can read each chapter together or read it separately ahead of time and discuss it during your scheduled Couple Time. Well-written and practical, 15 Minute Marriage Makeover was such an encouragement! Each Week has its own chapter; each Day has its own section to read with three main parts: Today’s Lesson, Today’s Couple Time Task, and Today’s Tips. Most days only require a 15 minute commitment. Once a week, there’s a date night (or Extra Couple Time) written into the chapter. You still have something to discuss; they just encourage you to take longer than 15 minutes at least once a week. Life gets busy and it’s easy to let date night fall by the wayside, but I encourage you to bring it back on a regular basis, whether you have kids or not. Don’t let the busyness of life allow your relationship with your spouse to take a back seat. Oh, and if you think you’re just too busy, you may be encouraged by this recent post. The 15 Minute Marriage Makeover is available for $17 from FitMarriage.com. Purchase here and you’ll receive an email with a link for immediate download. If you’re still not sure, view a free sample of the book here. FitMarriage.com is about helping busy couples stay fit and grow together (instead of apart) in their relationships. They also have How-To Videos for various exercises as well as a fitness program (Thrive90) that will help you prepare for completing the P90X program (popular Beach Body exercise DVD set that’s incredible and intense). I hope you enjoy this book. And whether you read it all or not, purpose to spend quality time with your spouse today. Plan a special date night soon: just because you’re married doesn’t mean you have to stop dating! Need to Change Up Your Walking Routine? Bring a Soccer Ball! Bryan’s had soccer on the mind lately. He’s trying to find a league in our area that he can join. He’s always been a soccer fan. We’ve enjoyed watching the World Cup together (though he keeps up with it more than I do). Last night, he had a great idea! As we were getting ready to go on our walk, Bryan grabbed his soccer ball and made sure it was pumped up with air. Instead of just walking, we passed the ball back and forth between us as we walked around the neighborhood. I wouldn’t recommend this near a busy road, but we live on a cul-de-sac off of a dead end road, so it’s pretty quiet. We did about a mile or so, then came back and just kicked and tossed the ball back and forth in the front yard. Then we tried to steal the ball from each other. This was so much fun! When we came inside, we got some water, then we locked ankles (sitting down and facing each other) and we tossed the ball back and forth as I did sit ups. This was such an enjoyable workout! It’s like date night and workout rolled into one. Try it some time! Our 4th anniversary is next week, May 20th! Since I’m starting school on Monday, I’ll be in class on the evening of the 20th, instead of a celebratory dinner with my man. Also, we have a friend staying with us next weekend and dinner plans with friends tomorrow night, so tonight really was the best night to celebrate. For Admin Day, I got a $50 gift certificate from my team for Table 301 (a chain of restaurants in Greenville). We decided to go to Devereaux’s, an upscale dinner restaurant. It was wonderful!! After my workout, I got cleaned up, put on my cute new summer dress and met Bryan. We walked down to the restaurant, arm in arm, and they let us take our table early. When I made the reservation online, I commented that it was our fourth anniversary and requested to sit at a quieter table away from the bar. When we arrived, it was like the whole staff knew it was our anniversary. They brought us complimentary little samples of various things and made sure to say “Happy Anniversary” on our way out the door. The waiter was fabulous too! I started with the Baby Artichokes, served atop fresh chick pea hummus, with house made olive flat bread, roasted red pepper oil, and frisee. Wow! It was absolutely delicious! I ate it slowly and savored every bite. Then they brought us each a small wheat roll and a small cheddar chive biscuit with fresh butter. For dinner, Bryan had the “Lamb: Old & New.” It was a stack of creamed potatoes, braised shank, house made pastry, lamb tenderloin, and plated with mire poix (celery, carrots, and onion) and roast garlic thyme sauce. Okay, I cheated for one tiny second and tried the lamb, and it was delicious. And I doubt 1/2 oz. of meat is going to make a difference in a whole month. After dinner, we took a nice long drive with the windows down, listening to sappy love songs, before coming home. Four years ago, I married my best friend. And today, I love him more than then. Happy Anniversary, babe! I love you!